I'm so excited to be back sharing another Scrapping Our Stash project this month. You could be arriving here smiling from BOBBI'S BLOG, Vintage Muse Designs - welcome! I've been doing a series of Wall Art Hoops inspired by this fabulous "stash only" blog hop you hopping. My wall of hoops is getting to look more like an actual inspiration wall instead of just a few random non-matching projects! I added two hoops this week, and this is one of the new additions. This time I covered the inner hoop of my embroidery hoop with strips of Washi Tape, just looking to make a solid surface to glue on since I knew you wouldn't even see the fabric. Plus, I couldn't find my bag of fabric scraps. Ahem. Then I grabbed my huge bin of paper flowers and started gluing. I covered the base with lots of the scraggly can't really use them white flowers that I also couldn't bring myself to purge. Then I added anything I could find in pinks, purples, a few yellows, and teals. Some are slightly altered from previous projects with marker or glitter. Even the butterfly was a leftover from another project, already inked and glittered. Then I dug into my sparkles stash and glued on a variety of odds and ends doo-dads I had leftover from well, everything. 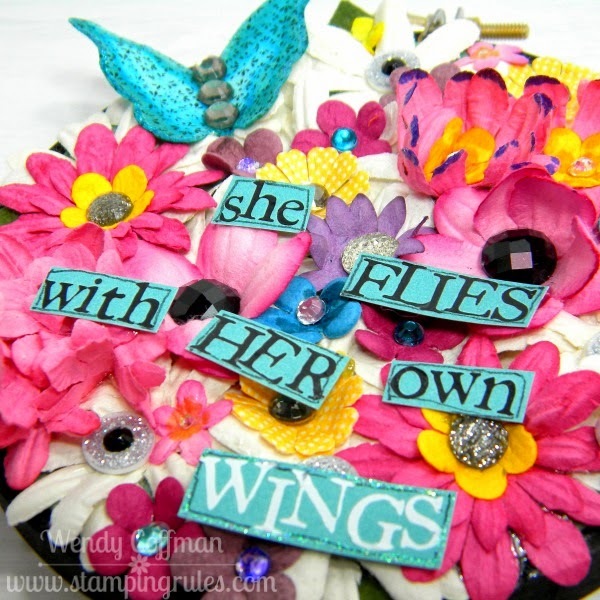 I used some really old rub-ons on scraps of Lagoon paper to make up the words of my quote. Each word was trimmed out and detailed with a sketchy little hand-drawn border. Then WINGS is white mostly because I didn't have enough black letters, but then I decided I liked it and gave it a bit of a glitter border too. I glued the words onto the flower bed with Liquid Glass and was happy to find they didn't fall off come morning even without foam tape. I'll share my other new hoop early next week - it's black and white and polka dot and very, very sparkly! 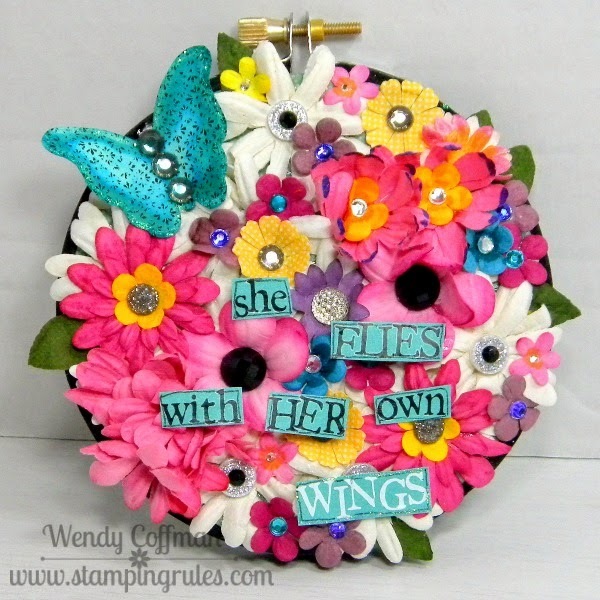 The next blog on the hop is Monica over at Scrap Inspired. I hope you'll be inspired to hit up your stash for hidden treasures, too! I love this. All of the flowers are so pretty and colorful. The butterfly has landed in a great garden. Oh, this reminds me of spring/summer! Love all the wonderful color, it makes me happy!!!! This is just so colourful and fun! Please can we bring on spring!!!! So pretty - love all those flowers. wow you project is amazing!!!! I Love this!!! What a beautiful way to give all those stash flowers a wonderful new home! TFS! I've never thought to use an embroidery hoop as part of the project itself. I love butterflies and your project turned out beautifully. What a fabulous project!! Love all of the bright colors! TFS!